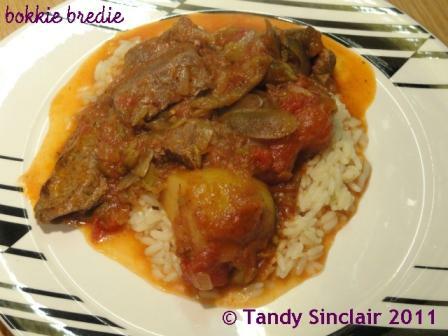 Using fresh springbok I made this venison stew, or springbok bredie if you speak Afrikaans. We were very fortunate to be given some Springbok from a friend at a very reasonable price. He charged us R100 (€10) for two loins, a shoulder and a leg, plus some bits and pieces for stewing, etc. The springbok is our national animal – it is venison, and our rugby players are known as the Bokke. Here in South Africa, we take great pride in our rugby – it is the national sport. It is also the sport that brought a nation together when we won the world cup in 1995. It is one of our proudest moments when the shout of “Joel you beaut!” was heard across the world as Joel Stransky kicked the winning points of the match. Springboks, as there name suggest, bounce all over the show – much like the thoughts in my head at present. This post has taken a path all of its own, much like my recipes do when I start cooking with no real plan in mind. ps waterblommetjie is a water hawthorn, which is indigenous so the area where I live. If you live in Australia, England, France and America (specifically California) you should be able to source them. Wow! So strange that you call it “waterblommetjie” because here we name the stew “waterblommetjie”, not the flower itself (whose chief ingredient is the waterblommetjie as you call it. Also called “pond weed” and used in aquariums if you can believe it! Great with the addition of waterblommetjies!!! Very local!! I stayed home this morning to watch France beat Wales. I loved some of springbok we ate while in South Africa last year. Some was really good and some just OK. I’m sure since it is venison you have to know how to cook it. I didn’t realize it was so expensive.waterblommetjies & Spanish rub? Must make friends with a hunter. Sorry, just making my to-do list for the fall. Looks great.